Dear customers! We are glad to present you the updated version Handy Backup 7.8.6, which contains a dedicated plug-in for E-mail service backup. It can download and back up any email messages via the IMAP protocol, using no bridge software such as email clients. This feature allows both webmail backup for popular services such as Gmail, Outlook and Yahoo!, as well as saving copies of dedicated E-mail services via IMAP. It can also restore email content from backup to an original or other email service, at a scale from the full restoration to any single message! The new plug-in uses the IMAP protocol to connect with an email server. It backup the messages in EML database format, openable by some local email clients. 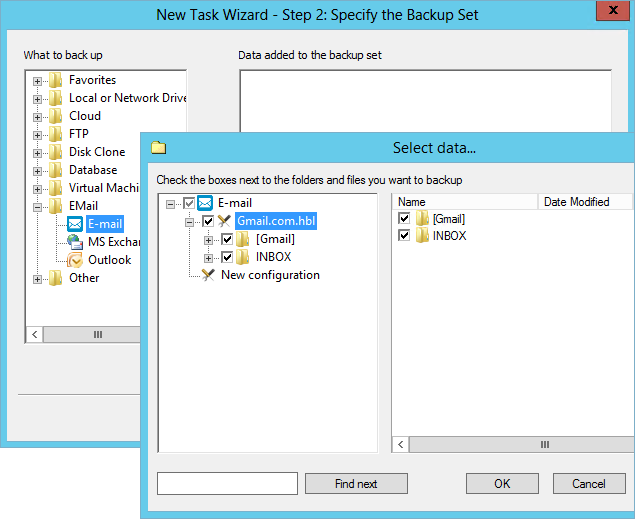 Handy Backup saves emails in the native formats (unless other specified directly), allowing browsing, moving or even modifying EML data files without a need for restoration. The new feature allows restoring a message database either to its original location or to some different place, using the same IMAP protocol as for saving data. This flexibility allows restoring all data to the different place, effectively cloning an E-mail backup to some other account or service. The restoration process allows selecting individual messages for moving, which can help avoid unnecessary data redundancy. Virtually any service using the straight IMAP protocol can serve both as a data source and as a place for email restoration. Among the tested platforms for this webmail backup software are the popular public E-mail services including Outlook, Google Mail and Yahoo! Mail.